on Amtrak's Acela Express including the Inaugural Revenue Run. Ray Burns of TrainWeb was a passenger on the Amtrak Acela Express Inaugural Revenue Run from Washington, D.C. to Boston, Massachusetts on Monday, December 11, 2000. Below you will find Ray's travelogue and photos as well as travelogues and photos from others of that Inaugural Revenue Run. Links are also provided to additional photos and information on the Amtrak Acela Express. Amtrak Acela Video Clips from Oaks Model Railroad Club! 07/24/01: Matt Melzer: Acela Express Travelogue! 03/16/01: Jack Halquist's Long Journey to Acela! Which Inaugural Run? Amtrak has labeled the November 16, 2000 run of the Acela as its inaugural run. TrainWeb, along with many railfans and many other rail passengers, considers the inaugural run to be the actual first day of regular passenger service. If the train does not operate on its next scheduled day of service, then has the service really been inaugurated? The Acela not only did not operate on the day after its "inaugural" run, but it did not run at all for almost a month after its "inaugural" run! The November 16, 2000 Acela trip was not so much an "inaugural" run as a V.I.P. run. The passengers on that trip were not paying passengers but were special V.I.P. invited guests and members of the media. 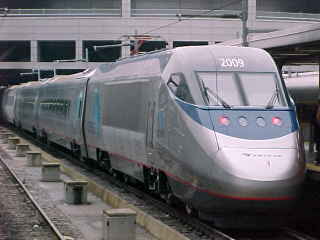 The actual start of service on the Acela was on Monday, December 11, 2000, leaving at 5 A.M. Eastern Time, scheduled to arrive into Boston, Massachusettes at 11:30 A.M. This is the first day on which the Acela has gone into scheduled service and the first day that the public could ride the train by just purchasing a ticket. Rick Remington, Amtrak's spokesman, even said: "This is really the day that counts, because it's the start of revenue service." To differential this date from the V.I.P. inaugural run, the actual first day of scheduled passenger service is called by many the "Inaugural Revenue Run" since it is the first run for which tickets are sold. 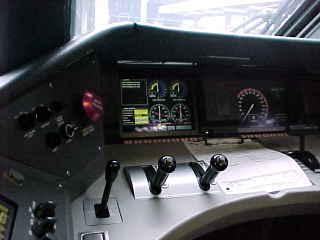 Sometimes TrainWeb is invited to the V.I.P. runs and sometimes we are not. TrainWeb attends the V.I.P. runs to which we are invited, but even when we are present at the V.I.P. runs, we also strive to be on the "Inaugural Revenue Run" since that is the run that we consider to be the historical first day of actual service for that train. Click here for Acela Regional service.